Commercial specialist Boyapati Srinu's upcoming yet to be titled action flick features Ram Charan and Kiara Advani in the lead roles. This Telugu film is planned for a Sankranthi 2019 release. DVV Danayya is funding this project under his banner DVV Entertainments. The movie is set in the backdrop of Vizag. Vivek Oberoi, Naveen Chandra, Aryan Rajesh, Sneha and Ramya Krishnan are also part of the cast list while Devi Sri Prasad takes care of the music department. The makers announced that the next schedule of this film begins today via Twitter, "Our next schedule starts from today in Azerbaijan, Europe. Mega Powerstar Ram Charan, @vivekoberoi, Prashanth and few other lead cast will take part in this power packed action schedule. 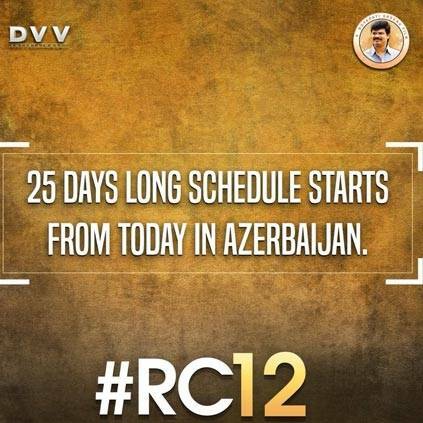 #RC12." People looking for online information on Boyapati Srinu, Ram Charan will find this news story useful.